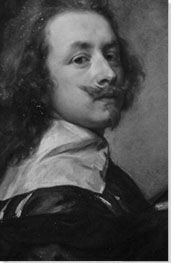 The below artworks are the most important by Anthony Van Dyck - that both overview the major creative periods, and highlight the greatest achievements by the artist. Artwork description & Analysis: This work depicts the moment of Christ's betrayal by his disciple Judas. Set in a wooded landscape, this biblically themed piece features a cluster of figures reaching out toward Christ who is pictured near the right side of the canvas dressed in a blue cloak. Judas is shown wearing a gold-brown robe and is positioned to the left of Christ, bestowing the kiss that completes his treachery. In the left foreground Christ's apostle Peter, with sword raised, is in the process of cutting off the ear of Malco, the High Priest's servant. Many of Van Dyck's early paintings, created while still working with his mentor Peter Paul Rubens, featured religious scenes. We see here, in the way he has rendered the reactions of the crowd, an early example of Van Dyck's skill with depicting complex emotions and individual faces, techniques he later applied to his many portrait sitters. Rubens must have admired the work as it was a part of his personal collection and upon his death was purchased by King Felipe IV of Spain. 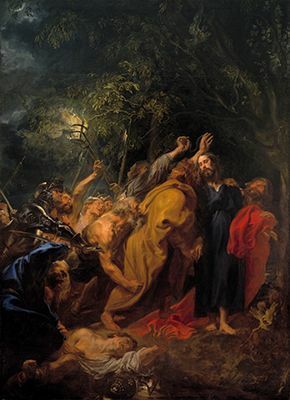 The scene is painted with a high degree of drama including the movement and jostle of the crowd as they reach out towards Christ, the violence of Peter towards the servant, and the dark turbulent sky overhead. This drama is further exaggerated by the low viewpoint and single light source, from a lantern held above the crowd. The lantern illuminates key parts of the canvas and draws the viewer, with the crowd, across the painting from left to right, ultimately focusing the attention on Christ's face. These compositional decisions along with Van Dyck's soft, sweeping brushstrokes provide an early example of the Baroque style of which he would become a master. Artwork description & Analysis: This portrait features Isabella Brant, the wife of Peter Paul Rubens. She is richly dressed and holds a fan made of ostrich feathers in her left hand and a white flower in her right, probably symbols of wealth, and of love or faith, respectively. 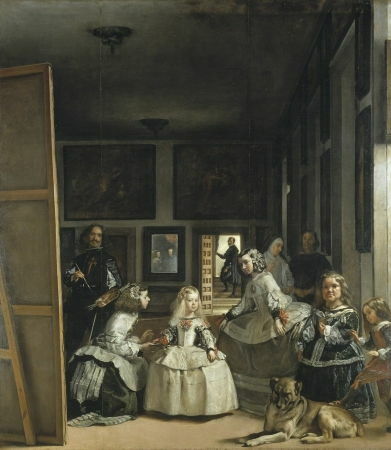 In the top left corner is a partially visible red drape which art historian Christopher Brown identifies as included by the artist, "...to disguise the hiatus between foreground and background". The landscape behind the drape is dominated by an ornate architectural feature which is, according to Brown, "...a replica of the three-arched screen that Rubens had built to link his house and studio". This was part of Rubens's recent home expansion project to demonstrate his wealth and ability and the structure became an Antwerp landmark, its Italianate style one of the first examples in Northern Europe. 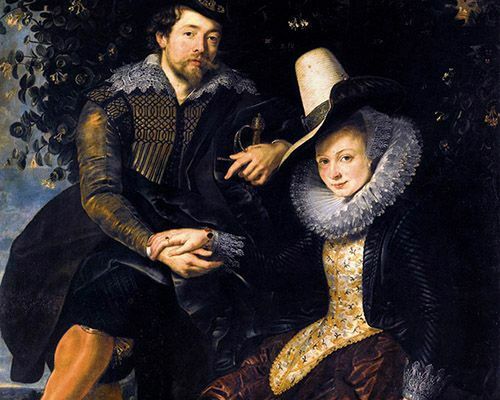 In the image Van Dyck contrasts soft, loose brushstrokes in some areas with immense detail in others and this can be seen in the intricate rendering of the lace on her cuffs and collar. For Van Dyck portraiture became a vehicle to express his affection for his sitters many of which were family, friends, or close acquaintances. Brant would have been an especially important subject as she was the wife of his mentor and this image was painted as a gift for Rubens and presented upon Van Dyke's departure from Rubens's tutelage. Isabella's face in the portrait appears to have been modelled on a chalk sketch of Brant completed by Rubens in the same year and this demonstrates the close exchange of ideas between the two in this period. Van Dyck has succeeded in capturing the vivacity and boldness of Brant's personality and the esteem in which he held her is clear in some of the details of the painting including the inclusion of a statue of Minerva, the goddess of wisdom in the background. 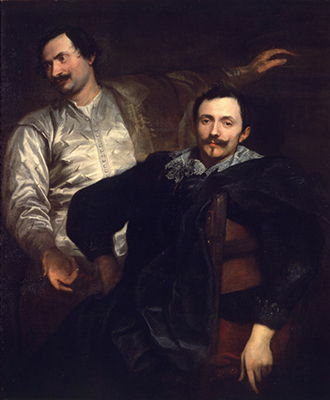 Artwork description & Analysis: Friends of Van Dyck, the artists Lucas and Cornelius de Wael depicted here, shared the bond of being from Antwerp. The brothers welcomed Van Dyck into their social circle when he first arrived in Genoa and this work was painted as a token of gratitude towards the brothers for their kindness and friendship. This painting is the first example of the Van Dyck double portrait, a composition which usually featured two men or women, who were often relatives or friends, painted together. Until this point double portraits usually depicted couples and Van Dyck, drawing on ideas from Raphael and Titian developed and popularized this style of friendship portrait. He is particularly known for introducing this and other new compositions to England, resulting in famous images such as Lord John Stuart and his Brother, Lord Bernard Stuart (1638). The portrait is an excellent example of the informal nature of Van Dyck's paintings and the introduction of such poses and compositions into his work marks a departure from Rubens's portraits, which were usually more formally arranged and executed. The brother in the foreground, probably Lucas, sits sideways on his chair with his arm draped casually over its back, whilst his elder brother looks beyond the canvas, smiling to an unseen companion to his right. Their interactions and postures give the painting the feeling of a modern snapshot, an easy familiarity, which is in direct contrast to the careful staging of more traditional portraits of the period. The work also demonstrates Van Dyck's incorporation of the Baroque style into his portraits and here it is most clearly seen in the dramatic light source which shines onto the brothers' faces. 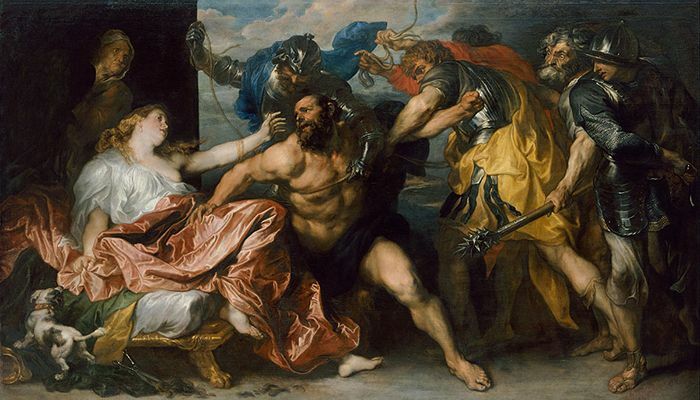 Artwork description & Analysis: A visualization of the Old Testament story of Samson and Delilah, in this painting Van Dyck depicts the moment after Samson has been betrayed. In the center foreground a barely clothed Samson struggles to resist the guards who are taking him to his inevitable death. This painting is Van Dyck's second recreation of the story and marks a maturity of his work. The first created between 1618 and 1620 featured a sleeping Samson in Delilah's lap as his hair is about to be cut. It is much more reserved and shows a greater influence of Rubens, who depicted the same subject. In contrast, here Van Dyck captures the climax of the story, the moment when Samson has awakened and learned of Delilah's betrayal. He is racked with agony that is clear on both his face and in the contortions of his body as he tries to resist the guards and cling to his betrayer, who he still loves. The depiction of Delilah has also changed, from a brazen temptress to a woman in conflict, regretting her decision, as she reaches out to Sampson. It is certainly a more modern approach to the subject than his previous work and that of Rubens, and as Hans Vlieghe notes, Van Dyck succeeds in "...conveying the inherent tragedy of the drama in a much more penetrating way than Rubens". Despite the increased emotional impact of the piece, the continued influence of Rubens can be seen in some of the details of the work particularly in the musculature of Sampson and the design of Delilah's dress. The colors, however, are bolder and more vibrant that Rubens's earlier work and this suggests the later influence of Titian on Van Dyck as well as his own increasing interest in mixing and experimenting with new tints. The painting shows Van Dyck's mastery of the dramatic and the intimacy and vulnerability with which he portrayed the figures broke with the classical tradition of many artists of the time. 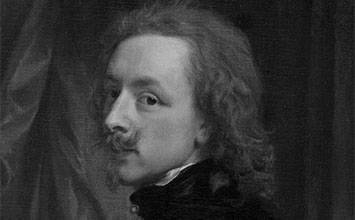 Artwork description & Analysis: Van Dyck stands on the left of the canvas, opulently and fashionably clothed and looking out at the viewer. With his left hand he draws the viewer's attention to the gold chain he wears and with his right hand he points to a large yellow sunflower which dominates the right side of the canvas. This work is one of many self-portraits Van Dyck created during his career although it is more dramatically rendered than most. There is considerable debate regarding the meaning of the piece, particularly the inclusion of the sunflower. 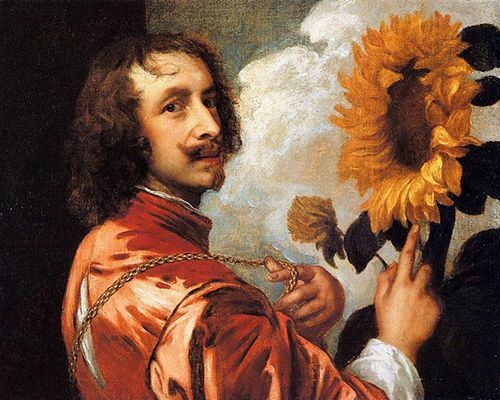 In describing the painting, art historian and curator, Judy Egerton states, "it is not known whether Van Dyck painted his Self-portrait with a Sunflower for a patron (royal or noble), for a friend, for a lover or for himself. This is a highly sophisticated image in which the painter is primarily interested in himself. His rich dress, his valuable gold chain and his confident expression all proclaim him to be enjoying success: he basks in the presence of the glorious sunflower, which may well have a multiple meaning, symbolizing royal favour, his art and his fame." 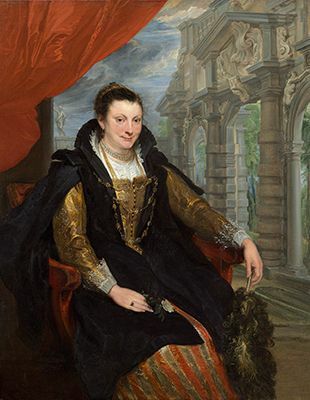 While the intended meaning may never be known, the work can certainly be viewed as a vehicle for Van Dyck to make a statement about his transition from child prodigy to respected, mature artist with a strong connection to English royalty. In the two years in which this painting was created, the English King both knighted the artist and gave him a gold medallion on a chain and this may be the chain which Van Dyck wears in the portrait. Artwork description & Analysis: Le Roi á la Chasse, or Charles I at the Hunt, features the English King aristocratically attired and looking over his left shoulder at the viewer. Behind him are two attendants and his horse. The figures appear to be caught in a moment of contemplation and rest in a wooded landscape with a body of water just visible in the background. This work is an important example of the paintings Van Dyck created of the King and his family in his capacity as official court painter. While many of these portraits were more formal and functioned as a method to disseminate royal propaganda, this work is different. It portrays the King at ease, enjoying a moment of activity for his own pleasure. It also serves as a visual confirmation of the relationship between the artist and king in that Van Dyck was granted access to such a moment and felt empowered to render it on canvas. Despite its informal setting and appearance, the piece is not completely without symbols of sovereignty. Charles is portrayed holding his gloves in his hand, a sign of his royal status and he is seen surveying his lands, possibly the Solent, with the Isle of Wight visible in the background. There is also a Latin inscription on the rock in the bottom right hand corner of the canvas and this translates as "Charles I, King of Great Britain". This was a bold and political statement at this period as Charles's father had only united the crowns of England and Scotland just over 30 years previously and the painting pre-dates the Act of Union of the two countries in 1707 by nearly 70 years. 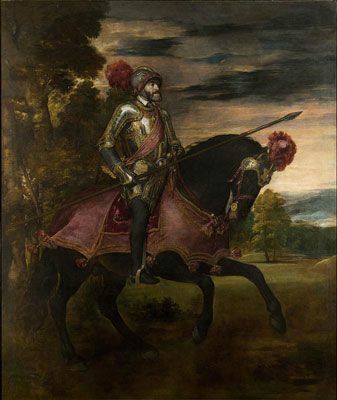 The work draws on the equestrian portraits of Titian, but Van Dyck adds his own stylistic touches to the genre, showing the King dismounted and combining elements of the formal and informal in the composition. 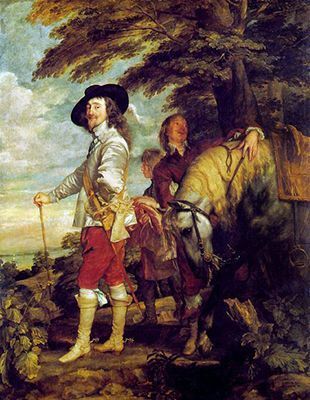 Van Dyck was an advocate of outdoor settings and images such as this one formed the foundations for the English School and had a significant influence on portraitists such as Thomas Gainsborough and Sir Joshua Reynolds. 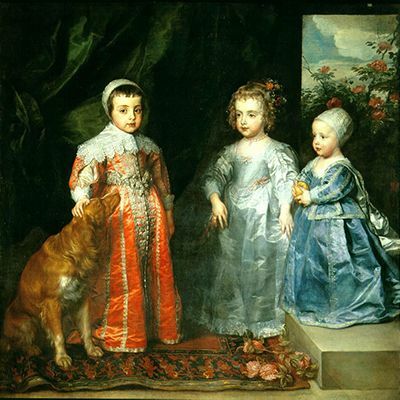 Artwork description & Analysis: The sitters in this image, from left to right are Prince Charles, Princess Mary, and James, the Duke of York. The family dog looks up at Charles while the boy absently pets his head as he gazes out towards the viewer, his authority and potential to rule clear, even at his young age and the other two children look to him reinforcing his status as the eldest. This work is one of many Van Dyck painted of children and dogs and in doing so he helped to elevate these subjects to the same level of artistic regard as adult sitters. Here, he clearly captures the unique personalities of the three children, highlighting both their status and their childhood innocence. The scene is one of a happy family and this sense of tranquility is supported by the glimpse of sky and garden in the background on the right-hand side of the scene. This is one of many carefully rendered details in the image including the interior elements of the room and the elaborate decoration on the clothing of the sitters. The canvas was commissioned by Queen Henrietta Maria as a gift for her sister, but, interestingly, her husband King Charles I did not like it, taking issue with the fact that Van Dyck had depicted his eldest wearing a long skirt, a style common for young boys before they were 'breeched'. Charles may have seen this as emasculating in terms of royal propaganda, especially for Prince Charles who was next in line to the throne. At Charles's request Van Dyck painted a second portrait of the children later that year in which Prince Charles was wearing breeches. Van Dyke's accurate portrayal of children's clothing and his ability to capture the unpretentiousness of youth was in direct contrast to court painters elsewhere in Europe, particularly Velazquez, who painted, even very young, children dressed and posed as miniature adults. Artwork description & Analysis: This mythological scene was one of several, similarly themed, paintings that Van Dyck made at the request of King Charles I, possibly to decorate the Queen's House at Greenwich. In the story, the goddess Venus was jealous of Psyche's beauty and set her a number of tasks including the transport of an unopened casket from Hades containing a small part of Prosperine's beauty. Curious, Psyche opened the box and sent herself into a deathlike sleep. This image shows her unconscious, about to be rescued by her husband Cupid, who later grants her immortality. Set against a dramatic landscape the tree on the left is in full bloom while the one on the right, under which Psyche lays, is barren, symbolically showing her near-death state. It is thought that the model for Psyche was Margaret Lemon, a woman who was also the artist's mistress for a brief time. The subject was not unique to Van Dyck and many artists including Titian, had previously painted the myth. What distinguishes this work is that it embodies the Baroque style; beautifully romantic and rendered in soft brushstrokes, the work is awash in light and drama. It also lacks the grand classical quality of past versions and rather displays a sense of intimacy between the figures for which Van Dyck was known. Psyche is vulnerable in her sleeping state and Cupid, alive to the dangers of the situation rushes to her aid; their reunion is a tender one.